Happy Friday, lovelies! Is everyone excited for the holiday weekend?! My hubby will be home for a 4 day weekend!! That alone is reason to celebrate in my book! 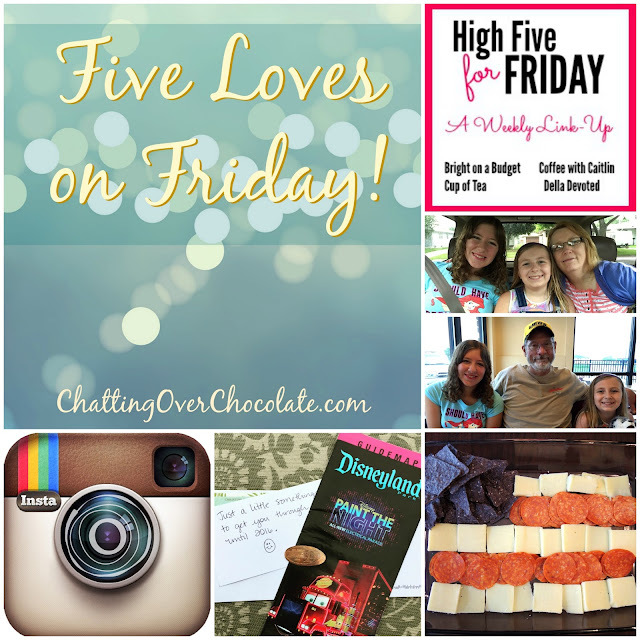 Before we get to all the holiday hoopla though, I'd love to share five loves from this week with you all! 1. 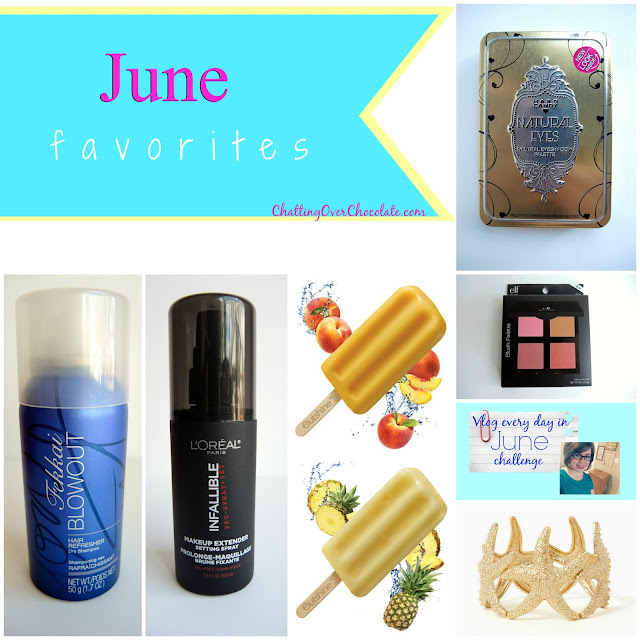 Featured Blogger on H54F! 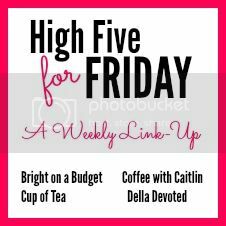 I am tickled pink to be the featured blogger for this week's High Five for Friday link party! A big THANKS to H54F's fabulous hostesses Tif, Katie, Caitlin, and Della! I look forward to linking up each week, checking out my favorite bloggers' weekly highlights, and discovering new blogs along the way too. If you're visiting from H54F, WELCOME! I hope you'll take a moment to peek around a bit and say "hello" so I can return the visit to your blog! If you have a blog and haven't linked up to this party, you should! 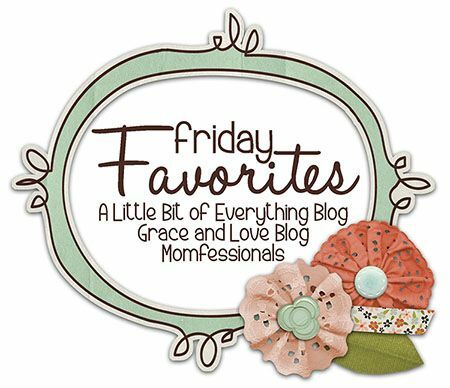 There is such sweet community of bloggers that join in on the fun each week and we'd love to have you there too! My parents are on vacation from their jobs this week. We were thrilled to hear that they wanted to spend one of those free days with us! They treated the girls and I to a nice lit'l road trip in their new SUV and took us out for some tasty Mexican food! Side note: I had totally forgotten just how yummy Taco John's chicken soft tacos are! (Plus, they're only 190 calories! Win/delicious win!) I highly recommend those sweet Mexican Donut Bites too! Delish! I finally starting using Instagram this week, and I'm loving it! I've been hesitant to get in on it as I didn't really need another reason to be looking at my phone. ;) It seems like the best of social media though - plenty of fun and loveliness, zero drama! If you'd like to follow my adventures snap by snap you can find my insta HERE. Is there anyone else I should be following? Whose posts do you most enjoy? 4. Disney Mail + Upcoming Trip Reveal! My super thoughtful blogging bestie, Chrissy from Adventures in DIY, sent me a fun envelope of Disney goodies this week! 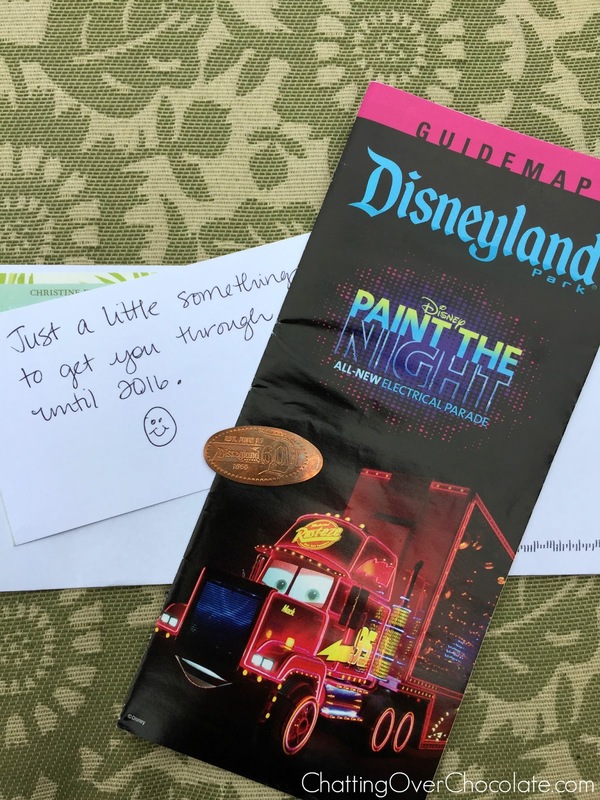 If you take a look at her note you'll see what we are planning for our 2016 vacation! I'm so excited I could nearly burst! We're just a few months out from our next Disney World trip, and are now planning our first ever trip to the original, Disneyland! I can hardly wait to soak up the all of the magic and bring it back here for you! Many new Disney trip reports to come!! YAY!! Psst...if you're new here and (like me) love all things Disney be sure to check out my Disney tab for recipes, crafts, tutorials and trip tips. Need a "virtual vacation"? Scroll and stroll through my Disney World Trip Reports for 17 days of Disney goodness from our last trip to the World! I love celebrating the 4th of July! As I've been prepping for this year's festivities I thought I'd share some of my favorites from past holidays in case any of you are looking for a few simple last minute ideas. I know I am! Do you have any you'd like to share? Be sure to leave me a comment below! 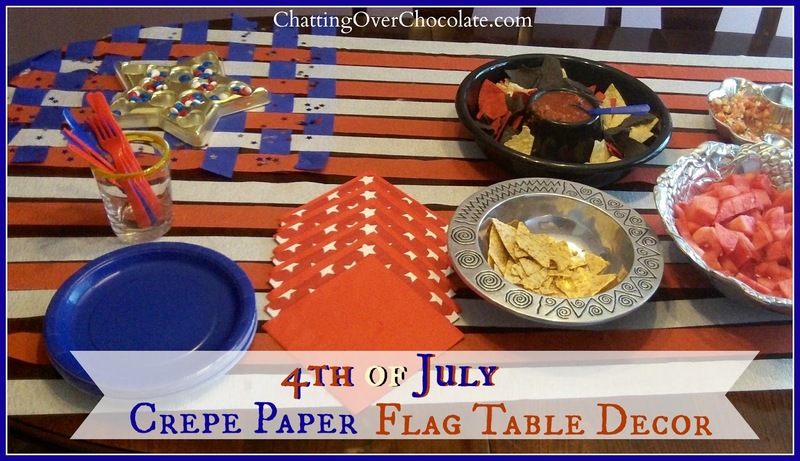 This patriotic "flag" decor cost me only $4 and was a cinch to throw together! See my full post with details HERE. These simple pancakes will add a colorful pop to your breakfast table in a few easy steps! Separate your pancake batter into three bowls. In one of the bowls add red food coloring, in another add blue, then stir each. Leave the third bowl of batter as is. 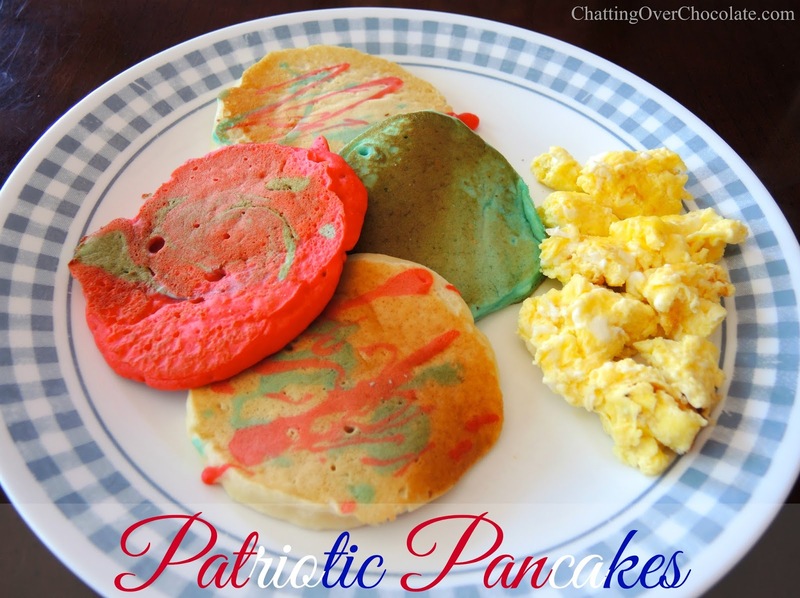 For another fun touch toss a bit of the colored batter into squeeze bottles and squirt over pancake batter. Now you're all set to cook up a festive start to your holiday! If you have kiddos in the house be sure to have them join you for some of the color mixing. They'll enjoy it even more if they've had a hand in creating these edible masterpieces! I use Bisquick's Ultimate Pancakes recipe. When your cakes are done cooking, top with your choice of yumminess. Syrup and fresh fruit are always delicious additions! Using a deep rectangular dish, form a flag by tossing some blue corn chips in the upper left corner, then add alternating rows of white cheddar and pepperoni slices. I made this for my family of four. If I were to serve this at a party I'd stack those cheese layers a few squares high. *If you are reading this blog post via an email subscription, you can view the video here. Last year I made the red, white, and blue beverage that she shared. The girls enjoyed it, so that's going on the repeat list for this 4th! 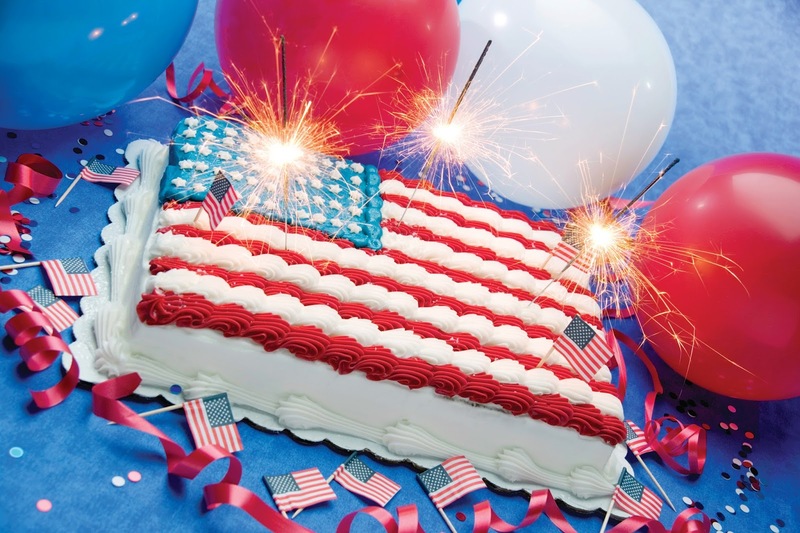 Do you plan to celebrate this weekend with anything fun or delicious? 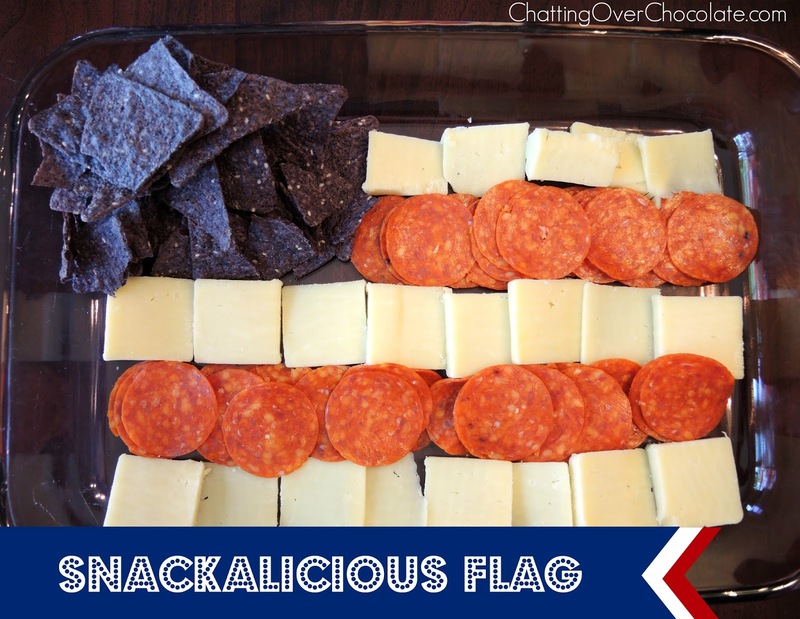 If you've shared any Independence Day inspired recipes, outfit inspiration, or craft posts please feel free to share a link in the comment section! I'd love to check them out! Wishing you a spectacular Independence Day weekend! I've been following your blog for awhile now, love it! We did Jedi training camp last year at HS, because I found out about it in your Disney hauls post! Ever since then, I've been obsessed with Disney. We just returned from a short trip there a few weeks ago! I've requested to follow you on Instagram. Hope to hear from you! Thank you so much for following, and for taking the time to leave me this sweet comment today, Ann! I'm so glad you heard about the Jedi Training Academy through one of my posts! :) That's awesome that your family enjoyed that unique experience too!! There's nothing quite like seeing your kid light saber dual with Darth Vader himself! ;) Have a fabulous 4th!! Congrats on your H54F feature! I was happy to see your face on the post when I linked up this morning! :) Girl, that flag crepe paper decor is SO cute!!! Love it. I'm so glad you're in Instagram now! Enjoy the weekend with your hubby - a 4 day weekend is such a treat! Happy 4th! Disneyland is so great! I went to Disney World for the first time last fall and actually think I prefer Disneyland--it's just less overwhelming for me. And It's a Small World is way cuter :) Congrats on being the featured H54F blogger and happy 4th! I cannot wait for your trip out here next year! WOO HOO! Looks like a fun week!! And that patriotic food looks amazing :) Following you on IG now too (@alexis.roch), so looking forward to connecting with you there. Hop you have a great 4th of July today!! I'm a big fan of Instagram - fun and beautiful photos, snapshots of life and no drama to weed through! We're taking our first WDW trip in Aug. I'll definitely check out your trip reports for some good tips. I'm trying to not feel overwhelmed by he whole thing! 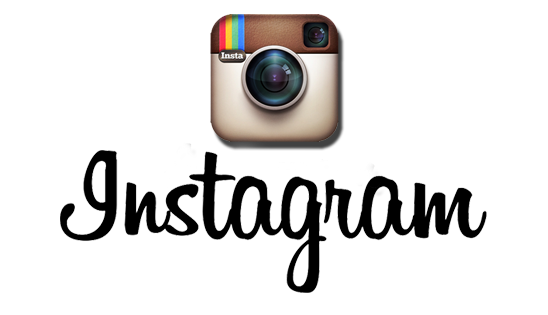 I love Instagram and that's so great you just got an account! My little boy loves pancakes! Ill have to try it with food coloring sometime! 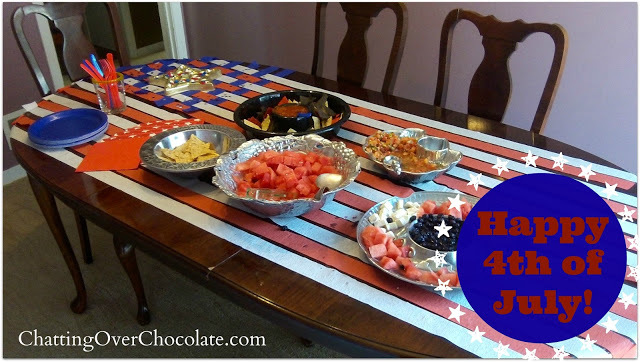 The Fourth of July decor and snacks are adorable! I hope you had a fabulous weekend! Yay for everything, but especially #s 1 and 3!!!! Instagram is such a fun place. Have you figured out the hashtaging yet? You should def search #disneyworld and things like that. You'd probably find some great people to follow that way:) I think we're taking Kane to Disney World next year and I can't wait!!!! Thanks for being a part of H54F!!!!! So fun that you got to spend time with your parents! And welcome to Instagram! It is so much fun! :) Hope you had great holiday! Oh my word, those snacks look SO yum!!! 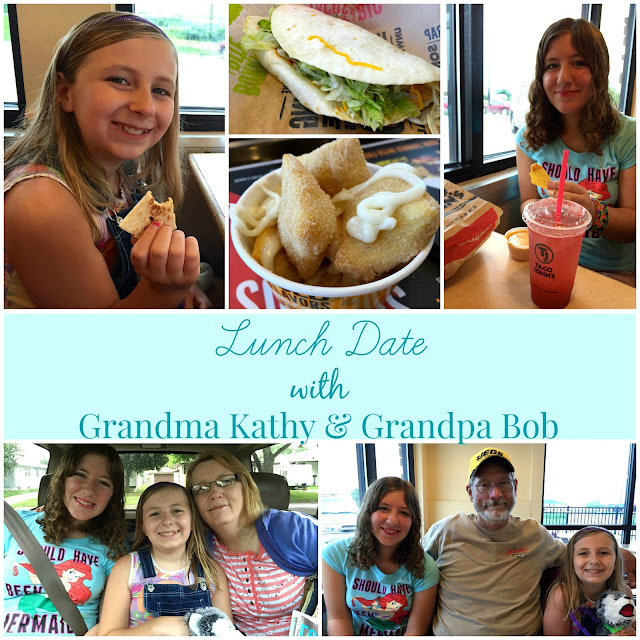 And grandparent lunches are the best!!! Hope your weekend was AMAZING!!!! your posts always make me so hungry! I was trying to be such a good girl and I didn't plan anything festive for dessert on the fourth - but naturally all day I regretted it. Just a little red white and blue sweet to end the day! Sadly just sparklers. I need that cake, the whole thing! Very excited about the IG! Congratulations on your feature. Don't you love when others find your work worthy of posting! I requested to follow you on Instagram. That is my most favorite social media platform. Just love it. Spend way too much time on it but that is what is so great, you can be in and then out. Enjoy your week.